Clive Bond is finding his paws very fast indeed. He has grown a little since his arrival, 21 days ago. But it is in bold audacity that he has proved he can excel. We began by instigating a stairgate so that he could choose when he first saw Macaulay the family dog, and on what terms. His first few days were spent in my study, a roomy middle floor cushioned paradise with all modern kitty conveniences. He seemed so timid we could not imagine him ever taking over this huge three story monolith as his own. But it was all a cover. Having cased the joint enthusiastically, it seems there is nowhere he dare not tread, and no-one he dare not challenge. He sees Macaulay – much to the dog’s chagrin – as a sparring partner. Clive began by approaching Macaulay with small bristling arched back and a sort of sideways canter-challenge. Now, he is more often seen charging him full on. He occasionally jumps on the dog from above, and will saunter with intent towards his food bowl, though how he could ever hope to ingest one of Mac’s great food boulders is beyond me. The dog is endlessly patient. Although it occurs to me that his slow reaction time means most events are over before he has actually registered them, leaving him resigned and bemused. We fuss him and buy him bones: but nothing makes up for the fact that the little upstart is allowed on the bed when he must lie, as always, obediently on his cushion on the floor. Bond has all the dashing derringdo of his namesake. He is bold, and quite bad, and when he’s crept under the duvet he is dangerous to know. Perhaps we should have called him Byron. But he is still young, with the purr of a Harley Davidson and a habit of mad spurts of energy followed by languid super-naps. The world lies at his paws, waiting to see what will unfold. Posted in Clive BondTagged cats, kittens, petsBookmark the permalink. Just gorgeous! It seems that the dog and cat are getting along without tearing each other to shreds. That’s always good. Good boy Macauley! He is being very well behaved, Kate! I shall prepare myself, Roger, for twenty years of second class citizenship. I love it. You will have to blu-tack every valued ornament in your home (once upon a time I learnt too late that the delicate paws had no delicacy at all when playing ‘don’t touch the floor’) Enjoy. I must remember that tip, Elspeth, thanks! He does. Or possibly a Zorro. He’s so adorable. I want another kitten! They are rather moreish, PT! Later we’d find them napping together. Best wishes to Macaulay and to Bond, the new kid on the block. Thanks, Judy. Early days, but things are shaping up nicely between the two animals. There’s a compliment, Sidey, thank you! I’ve been hoping for pictures of this rambunctious kitty, Kate. He is aptly named and I can imagine him sparring with Macaulay, as they teach each other new tricks. It is so funny to watch, Penny! Bond has one of those sweet and innocent kitty mugs even though he’s plotting all kinds of havoc that is trying Mac’s patience. Good thing that Mac’s too much of a class act to read “Hating Kitties for Dummies”. Hm. Now I’m looking forward to the next Bond update post, but he’ll be hardpressed to surpass the tale of Mac and the bone he attempted to bury in the sofa. In my next life I want to be a Shrewsday critter. You are welcome, Val! Thank you so much for reading! The feline gets the bed and man’s best friend gets the floor no wonder kittys develop attitude. It does not seem quite fair, does it, Elvira. Thanks for the canine solidarity. Macaulay appreciates it. Oh my, what a cutie. Totally a Clive. Macaulay os a true gentleman, if a little smelly, Barbara! He has four paws under the table, that’s for sure, Tandy! 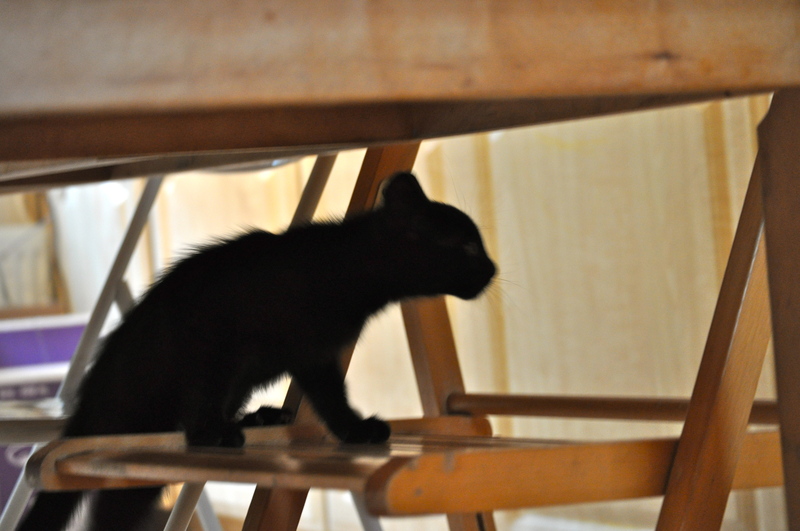 I always enjoyed it when we had kittens – they are always fun to watch. They have really helped the children as they went back to school for a new year, Patti. Most diverting. Beautiful post on your daughter, by the way…I loved it. It’s a good tactic, isn’t it, Debra? Dear Kate, as one who have lived with kittens and cats for forty years, I stand in awe of your astute observations of their shenanigans, their cunning frolics, and their exuberance. The phrase about side-ways cantering just delighted me. Thank you. Peace. Pleasure: it’s a hard movement to describe, isn’t it, Dee? Sort of stiff overtures towards a possible adversary. But I know you know the movement I mean exactly. The dog is a canine saint. The line about Byron nearly resulted in iced green tea all over my laptop! 😀 I have also entertained a connection with Zorro, Cameron. Caught up with you on FB today. Gutted, but understand. Sometimes, you just have to focus.